November 12, 1899 An Austrian tourist mailed this early, lithographed postcard to a friend in Vienna, perhaps to remember the warmer days of summer. It is presently being auctioned online as an antique collectible by a Vienna physician. Ruby Lane is a San Francisco-based Internet antique auctioneer. 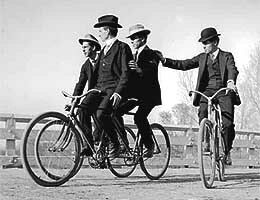 Most tandem bicycles were built in-line for a captain (driver) and a stoker (passenger), but a few joined men's and women's models side-by-side. Others provided a drop frame up front to accomodate a lady's skirts, but the combination of a woman driver and a man in close proximity to her derriere proved socially and economically unacceptable. The 1896 Orient Bicycle Company Oriten decacycle is on display at the Henry Ford Museum & Greenfield Village. Turn-of-the-century riders crossing the South Platte River in Denver. Daisy Bell was the title of an enduring popular song that is better known from a line in the chorus . . . "A Bicycle Built For Two." "When Dacre, an English popular composer, first came to the United States, he brought with him a bicycle, for which he was charged duty. His friend (the songwriter William Jerome) remarked lightly: 'It's lucky you didn't bring a bicycle built for two, otherwise you'd have to pay double duty.' Dacre was so taken with the phrase 'bicycle built for two' that he decide to use it in a song. 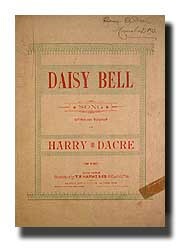 That song, Daisy Bell, first became successful in a London music hall, in a performance by Kate Lawrence. Tony Pastor was the first one to sing it in the United States. Its success in America began when Jennie Lindsay brought down the house with it at the Atlantic Gardens on the Bowery early in 1892." Listen to Daisy Bell is online as a MIDI file. 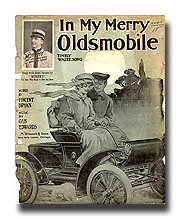 "Young Johnnie Steele has an Oldsmobile . . ." begins a song that many can hum today. Its refrain, "Come away with me Lucile . . ." was shocking for its inviting suggestiveness in 1905, and the song became a national hit for Morphy, who might have been the first one-name pop star in American music history. Gus Edwards composed the song and Vincent Bryan penned the immortal lyrics. It was published by M. Witmark & Sons on New York's Tin Pan Alley in 1905. 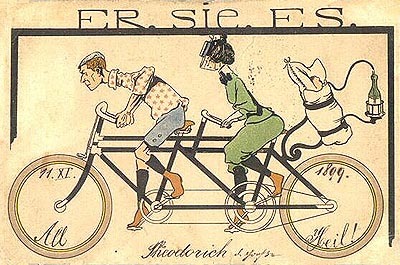 Bicycles built for two, four and even ten riders were fabricated by the turn of the century. About this time, a five-rider Pacemaker weighing 130 pounds, featuring an 11-foot, 10-inch wheelbase and a 15-inch diameter drive sprocket appeared as a cycling novelty in Portland. The World's Largest Bike is a British tandem that seats as many as 23 riders and claimed the record in 1998.